NOTHING characterized the stalemate at Bonn climate talks more than the candid admission by incoming executive secretary of the UN Framework Convention on Climate Change. 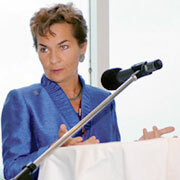 Christiana Figueres of Costa Rica, in an informal chat with media, said she did not think a complete climate deal could be reached in her lifetime. “Maybe in yours,” she said. Delegates had gathered in Bonn, confronting the mess created in Copenhagen. Several issues needed resolution, the most important being the legal standing of the infamous Copenhagen Accord. The new chair of ad-hoc working group on long-term cooperative action (AWGLCA), Margaret Mukahanana-Sangarwe, had prepared an advance text, which was released in May. This included various components of the Copenhagen Accord. As has been the practice, nations were expected to negotiate on this text at the meeting. But the chair changed the process this time. Instead of negotiating on this text, the parties were asked to offer their views on different areas. The chair would prepare a set of questions each day on a particular theme, and ask for the parties’ views. Based on this she prepared a draft text of 22 pages towards the end of the meeting and presented this to the nations. The developing countries rejected this firmly. They contended this text favoured developed countries and, specifically, those who wanted to “kill the Kyoto Protocol”. China was one of the countries critical of Mukahanana- Sangarwe’s process, saying they had gathered to negotiate not with the chair but with the nations. Developing nations said several controversial paragraphs had found their way into the text—without brackets, as if there was consensus on them when actually there was none. They said the text implied the Kyoto Protocol was a bygone. They found this unacceptable. The text referred to 2020 as a peaking year for all nations, which the developing countries had never agreed to. Almost all the developing countries rejected this text in the plenary, asking the chair to prepare a “balanced” text taking into account their submissions. India said its opposition to unilateral trade measures was missing from the text. Earlier on in the Bonn talks, India had asserted that domestic actions by developing countries not be misconstrued as their legally binding mitigation targets under any circumstances. Unlike the hyped run-up to Copenhagen, Mexico is downplaying ambitions of a full-fledged climate treaty when the 16th meeting of the climate convention is held there in December 2010. Mexico’s UN ambassador Luis Alfonso de Alba said in a process like this it is difficult to expect a comprehensive treaty in Mexico. He encouraged parties to instead agree on certain key issues like measuring reporting and verification (of mitigation action), climate finance and adaptation. Mexico is seeking to avoid a Copenhagen-like situation in which heads of state gathered on the last day leading to a pandemonium and ending with a weak Copenhagen Accord. Mexico is proposing a three-tier process. In October is planned a ministerial meeting of major economies; then, possibly, a summit before the Cancun meeting to give the political mandate; and finally the CoP, with negotiators finalizing texts on points of consensus.